On July 21, 2016 Lake Elsinore resident Kaycee Padilla witnessed something that shook her to the core. Approximately fifty feet from her home she saw her neighbor’s home engulfed in flames. The fire quickly jumped to two adjacent units in the Briarwood Mobile Home Park, destroying one and damaging another. Kaycee Padilla (l) goes over home fire safety with Red Cross volunteer Mehruba Zaman (r) during a Home Fire Campaign in Lake Elsinore. The American Red Cross serving Riverside County responded to that fire on July 21 and two weeks later brought 60 volunteers into the Briarwood community, educating residents about home fire safety and installing free smoke detectors as part of the Home Fire Campaign. The Home Fire Campaign is national initiative started in 2014 with a goal to reduce death and injury due to home fire by 25 percent over five years. Locally, the program is a cornerstone of Prepare SoCal. Looking at the damage caused by the fire, Kaycee and her husband David stopped to look at a charred bench seat built around a blackened sycamore tree. The day-long Home Fire Campaign installed 80 smoke detectors 32 homes in the Briarwood community. Ernie Calderon, Red Cross serving Riverside County disaster program manager, noted this program was a success because it hit home with residents. 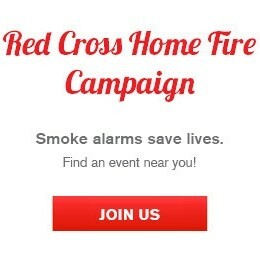 For more information about the Red Cross Home Fire Campaign, click here. Lake Elsinore Home Fire Campaign team! Prepare SoCal is multi-region campaign designed to address the needs of individuals and families to prepare for disasters, small and large, by providing tips, tools, and training, and to promote community resiliency with Edison International as a founding partner.